Coming of Age Day (seijin no hi) is a Japanese holiday held on the second Monday of January. It is a great day for kimono spotting. In day-to-day life in Japan, it is rare to see people in kimono. On Coming of Age Day, however, you will see them everywhere. Coming of Age Day celebrates everyone who turned 20 years old (the age of majority in Japan) during the past year. It is customary for these young adults to wear traditional Japanese clothing, especially the women, who wear furisode kimono with long swinging sleeves. Most men seem to opt for smart Western suits, although some of them do wear kimono and hakama. There are some young people, however, who have decided to put a new spin on Coming of Age Day fashion. A few days ago, I read a Japan Times article discussing ‘improper attire’ in the city of Kitakyushu. Apparently men have begun wearing brightly coloured hakama and women are dressing in a style of kimono that was popular with oiran, the high-class prostitutes of the Edo Period, showing lots of cleavage and shoulder. If you want to get an impression of Coming of Age Day celebrations in Kitakyushu (the city discussed in the Japan Times article), I recommend the video below. It shows a mix of traditional costumes and the newer styles. The guys in the beginning of the video really remind me of the anime ‘Great Teacher Onizuka‘, which basically means they look and sound like 1980’s gangsters. Also don’t miss the guy in ladies underwear at the end of the video. Judging from this video, it seems like a pretty raucous affair. Apparently the past few years it has not been not uncommon to have car crashes, fighting and vandalism on Coming of Age Day, although some places seem to be more famous for it than others. To be fair though, I think in most places in Japan people just dress traditionally, go to a temple and have a calm party afterwards with their friends. It’s always the excess that gets the most attention. I would love to have some reader feedback on this though. Please feel free to comment below! But back to Kitakyushu. Apparently some people were scandalized by this new kimono fashion trend and the city of Kitakyushu has responded by setting up a webpage to educate new 20-year-olds on appropriate attire for the event. Unfortunately I can’t read Japanese, but I watched the video. It shows how a girl is supposed to walk, sit, enter a car and even go to the bathroom (if I am not mistaken) while wearing a furisode kimono. Where are the recommendations for the boys??? I wonder though, if the main problem is the new style of dressing or rather the vandalism and violence that sometimes seems to be associated with Coming of Age Day celebrations. And why do these young people go so crazy, both in fashion and behavior? Several things come to mind. Firstly, innovations by younger generations are often perceived as shocking by older generations. This is a phenomenon as old as time. Secondly, I have come to understand that for many Japanese people, their early twenties is the only time they truly feel free. During their primary and secondary school years, they are under enormous pressure to pass entrance exams to get into good high schools and universities. After university, they enter the workforce and work long hours under strict behavior and dress codes. Or they start a family and are completely absorbed by their duties as parents (for many women this still holds true). During their university years however, they are free to do as they want. And finally, I do believe that Japan is changing. A new generation is emerging that is discarding the traditional ways and looking for their own way of doing things, much as happened in the West during the sixties. I am curious to see how things will evolve! 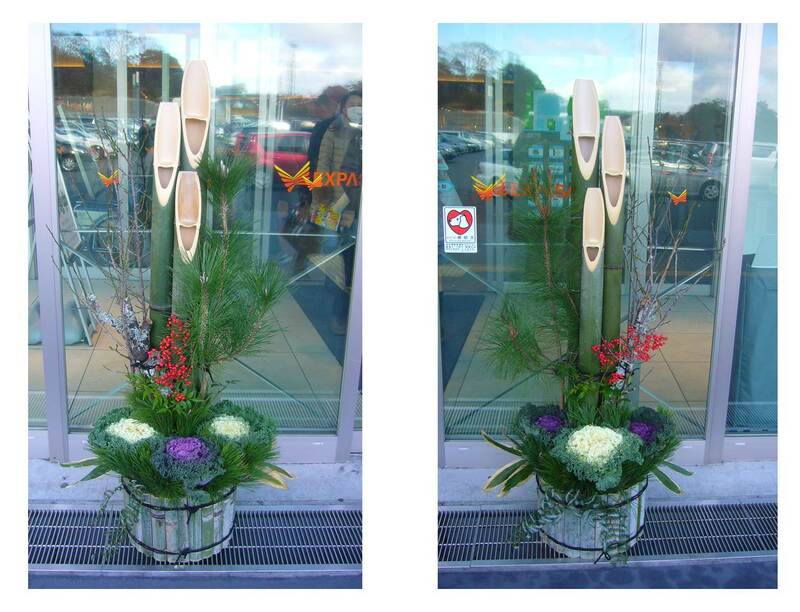 Around New Year’s time, you will see special decorations outside shops and in temples all over Japan. For foreigners, these public decorations are very interesting. Since we often don’t have access to Japanese family life, the decorations put up by shops and temples are the best (and often only) way for us to learn about Japanese New Year’s decorations. The picture below was taken exactly two years ago, on January 7th 2012. It is a small restaurant underneath the train overpass next to our apartment building. The two decorations on the ground are kadomatsu (門松, literally ‘pine gate’). Kadomatsu always come in pairs. Designs vary depending on region but they are typically made of bamboo and pine. Pine is considered lucky because it remains green in winter. Sometimes plum (ume) tree sprigs are also included, which represent longevity, prosperity and steadfastness. 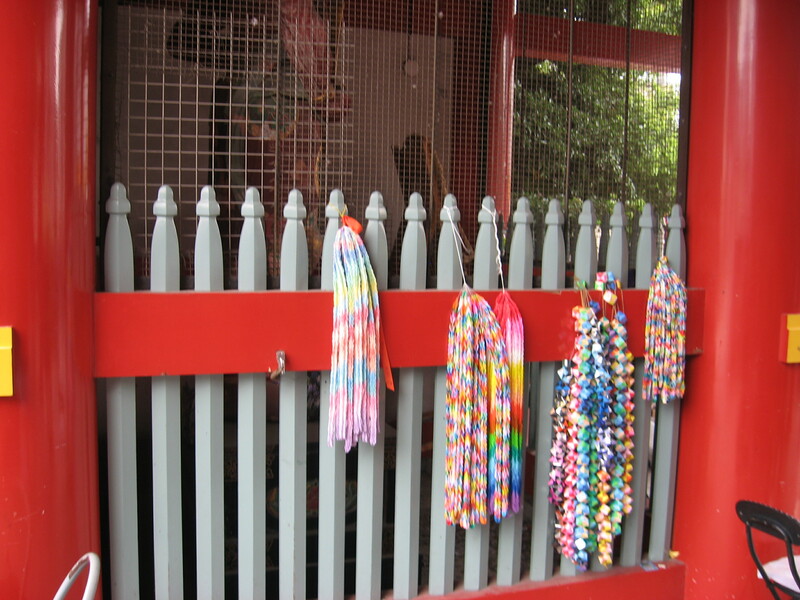 Kadomatsu are placed at the gate or door of a house, temple or business. They are an invitation for the New Year God (toshigami 年神) to come down from the sky. 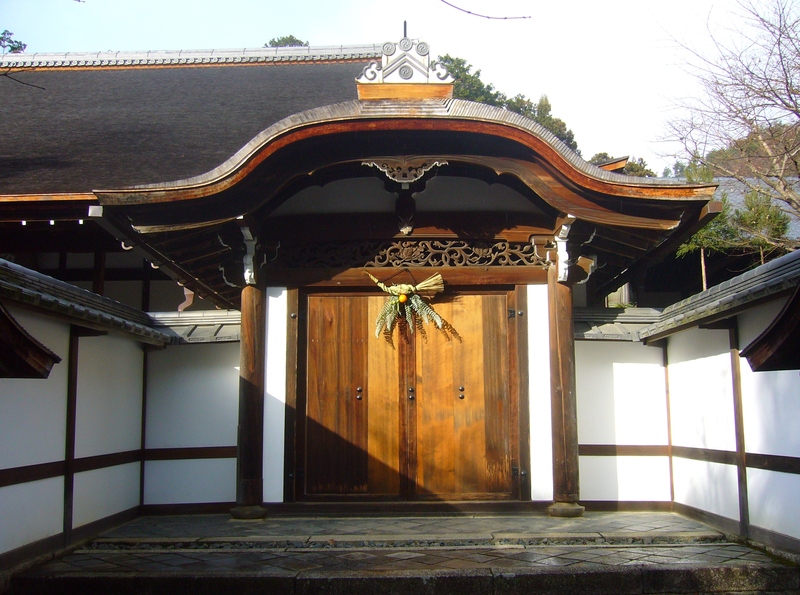 The kadomatsu are meant to provide temporary housing for the god. The New Year God is believed to bring a bountiful harvest for farmers and bestow the ancestors’ blessing on everyone. Kadomatsu are left outside until the 7th of January. After that, they are burned to appease the gods and release them. 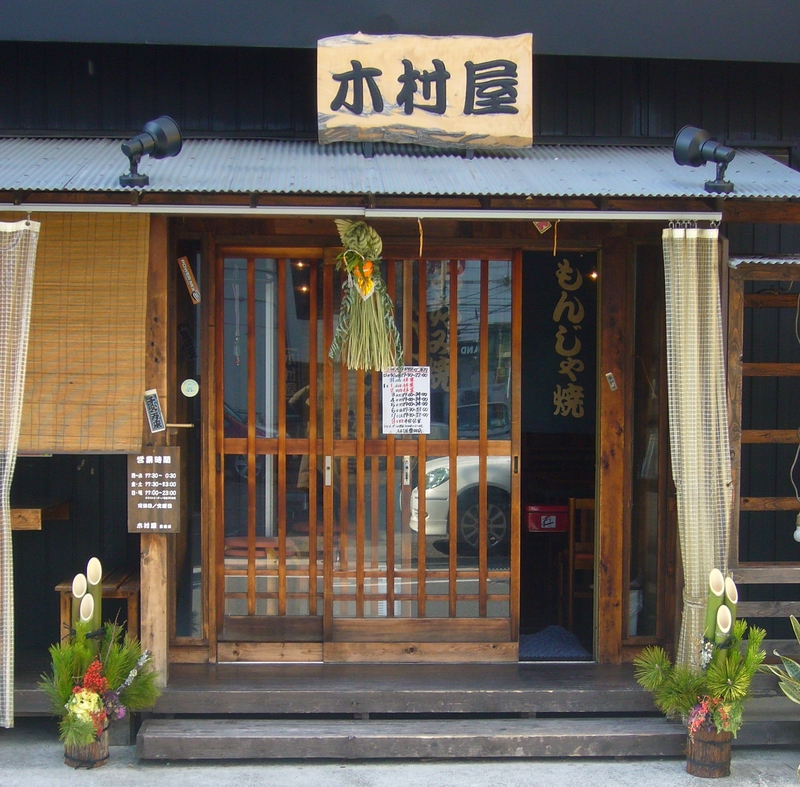 If you look back at the first picture – the one of the restaurant – you will also see a decoration above the door. That is a shimekazari (しめ飾り). 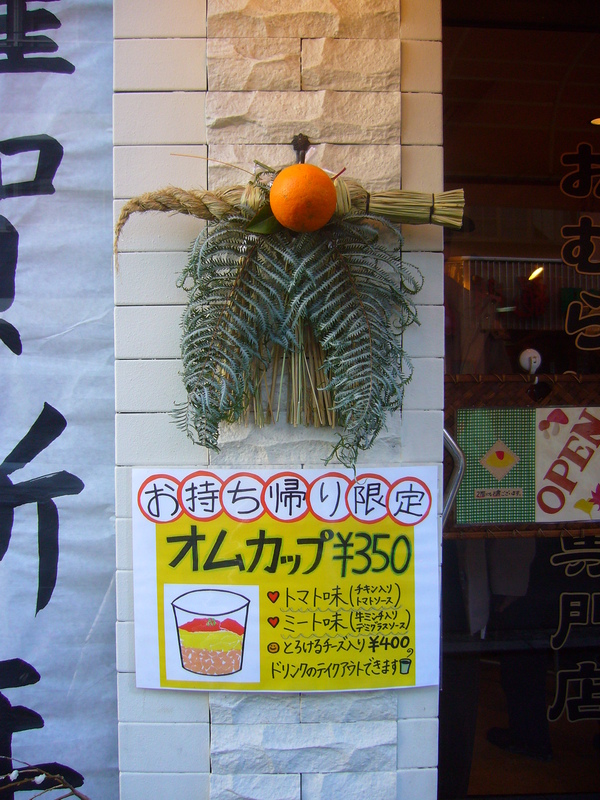 Again, there are many different designs for shimekazari but most of them include a sacred braided straw rope (shimenawa), fern leaves, white ritual paper strips (shide) and a bitter orange (daidai). 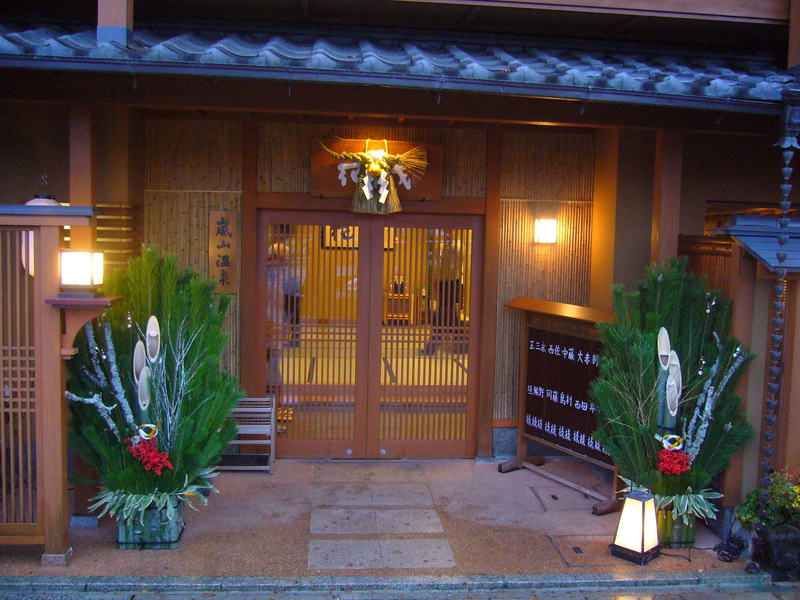 Like the kadomatsu, the shimekazari invites the New Year’s God to visit the home. Additionally, it is also meant to keep out bad spirits and thus prevent bad luck. In Japan, it is customary to send out New Year’s cards, or ‘nengajou’. While in the West, traditional Christmas and New Year’s cards are gradually being replaced by electronic versions and e-mails, in Japan cards are still being sent through the mail (which I quite like). 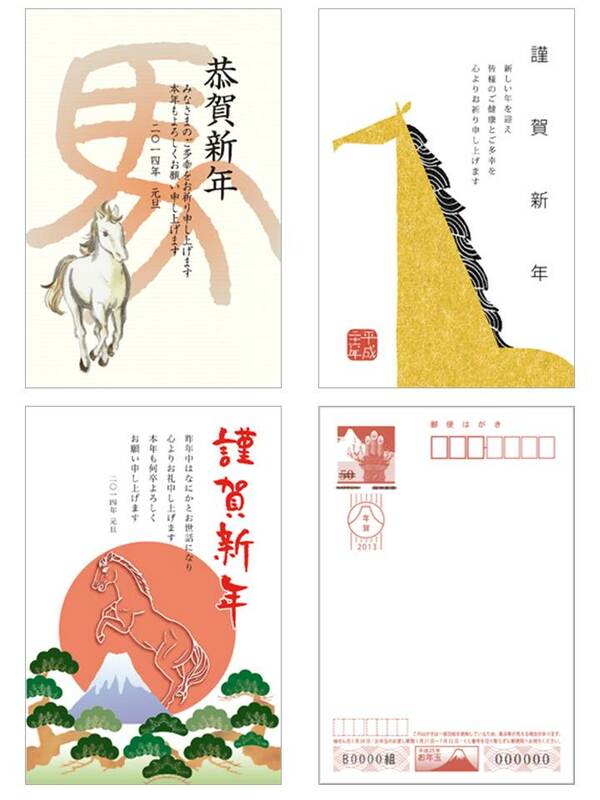 A few examples of the New Year’s cards that the Japanese postal services offer for 2014. Since 2014 is the year of the horse, many cards feature horses. Usually one side of a Japanese New Year’s card will have an image and/or a message, and the other side is for the address (featured on the bottom right). New Year’s cards are big business in Japan. 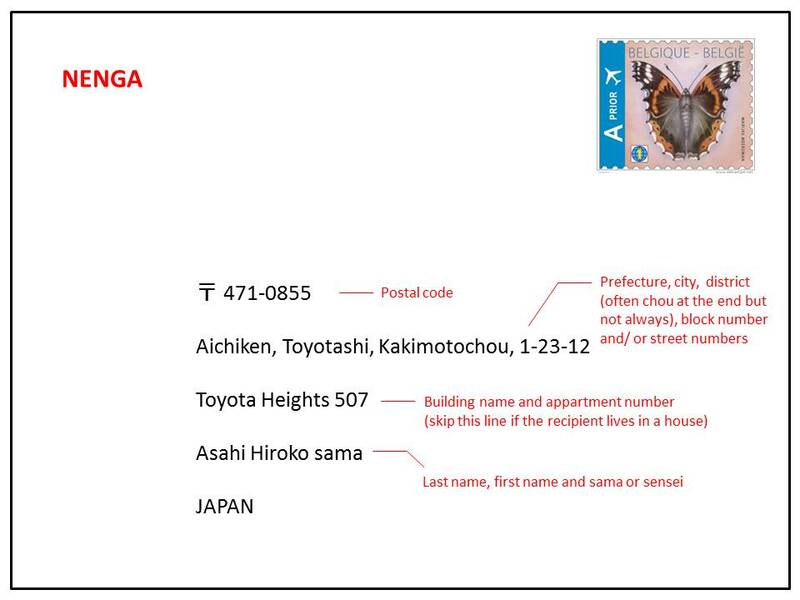 Every year, millions of cards make their way into mailboxes all over Japan. It is not uncommon for one household to receive up to 200 cards. Traditionally you are supposed to send a card to everyone you have some sort of relationship with or social obligation to. That includes all of your coworkers, for example. But these days not all youngsters comply with this rule. The postal service is of course well aware of this massive card sending habit and organises its service accordingly. All the cards posted before December 26th are guaranteed to be delivered on the 1st of January. That’s right. Not on the 31st, not on the 2nd. No, when the Japanese provide a service, they mean business. Postal workers work on the national holiday to ensure that everyone receives their cards on the 1st. Every year I gladly join in this Japanese New Year’s card extravaganza. Having lived in Japan for a year, I met many people who really did their best to make me feel welcome and who were very generous towards me. Sending New Year’s cards to my Japanese friends seems like the perfect way to show them that they remain in my thoughts and that I am grateful for everything they have done for me. At first, writing New Year’s cards in Japanese and figuring out the correct way to post them seemed like a daunting task. Once I finally figured everything out, I decided to write a guide for other people who might like to send cards to Japan as well. Make sure to send the card well in advance. It should arrive in Japan before the 26th of December. Another important point to note is that according to Japanese custom, you shouldn’t send a card to someone who has lost a loved one in the past year. But don’t worry if you are not sure about the addressee’s family situation. According to a helpful comment by Ayako Mathies, the original custom is that it is alright so send a card to families who have lost someone, but these families are not expected to send out cards or replies themselves. Since it will be difficult to find the typical Japanese New Year’s cards abroad, I recommend sending a card that is typical of your home country. For example, being from Belgium, I opted for cards with Christmas trees or cute little shops covered in snow. I tried to choose cards that invoke the romantic European winter feeling. 明けましておめでとうございます｡ Happy New Year! Unlike letters, Japanese New Year’s cards do not require a ‘dear x’. You can just open with the New Year’s greeting. Honnendomo [addressee’s name + san] ni itte yoi toshi de arimasuyou oinori moushiagemasu. ほんねんども　[addressee’s name + さん] にとって よいとしでありますよう　おいのりもうしあげます。 For formal situations (like writing to a teacher or someone who is a lot older than you). Kono ichinen ga [addressee’s name + san] ni totte sutekina toshi de arimasuyouni! のいちねんが　[addressee’s name + さん]　にとって　すてきなとしでありように！ For informal situations (like writing to a friend or someone you know quite well). 皆様のご健康をお祈り申し上げます｡ Wishing everyone good health. Sign with your name at the end. Write ‘NENGA’ in big, red letters in the top left corner (or in kanji: 年賀). It should be clearly visible. This tells the post office that it is a New Year’s card and that they should hold it until the 1st of January. In Japan, it is acceptable for cards to arrive after the 1st of January but not before the 1st. Make sure to never write a person’s name in red ink. This is considered bad luck because names on graves are also red. If you write the address in romaji (our Western, romanized letters), make sure to write very clearly. It is difficult for Japanese people to read our handwriting. If you can write Japanese, try to write the address in hiragana or even in kanji. If you opt for kanji, double-check that you write the addressee’s name correctly. Write your own address on the back of the envelope. And of course don’t forget to put a stamp on it. All finished! Your card should be good to go! 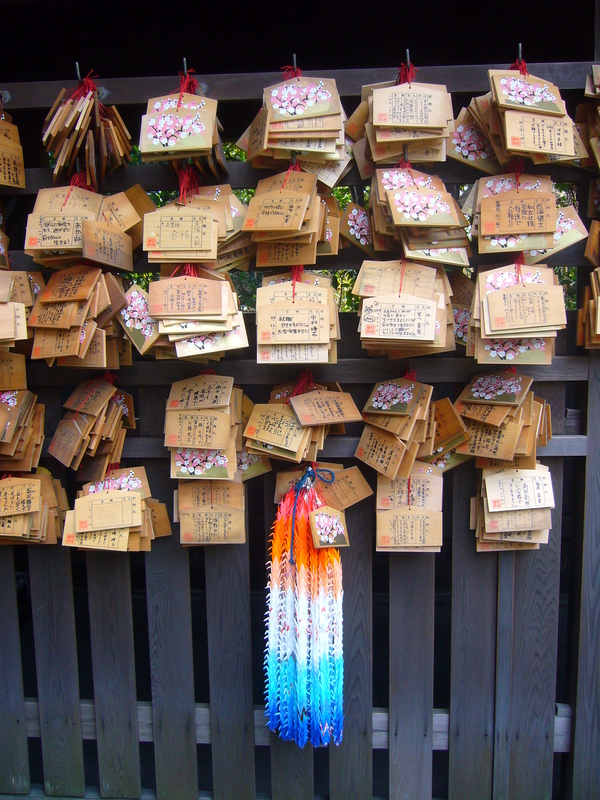 When visiting a temple in Japan, you will often see large strings of colored paper shapes, hung up in various places. Closer inspection reveals that these paper shapes are actually cranes. One thousand of them to be exact. The origami cranes are often arranged by color, fitted one close on top of the other and held together by strings. I love the visual effect of all those colorful strings of folded paper. The custom of folding a thousand origami cranes (senbazuru 千羽鶴) originates from an old Japanese legend. It is said that the person who folds a thousand paper cranes will be granted a wish. These days it is mostly used as a way to pray for good health and as a symbol of hope. 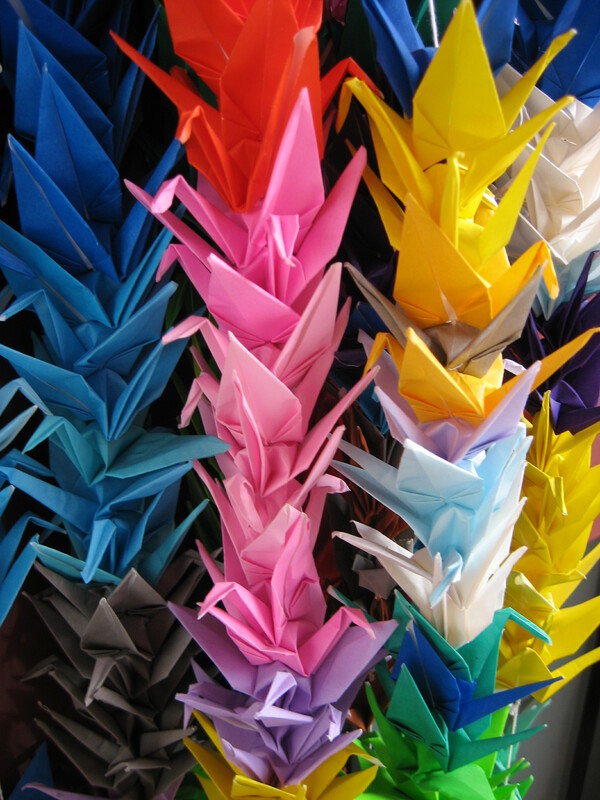 The origami cranes became famous through the story of Sadako Sasaki. She was a 12-year-old girl who developed leukemia due to exposure to the atomic bomb on Hiroshima. 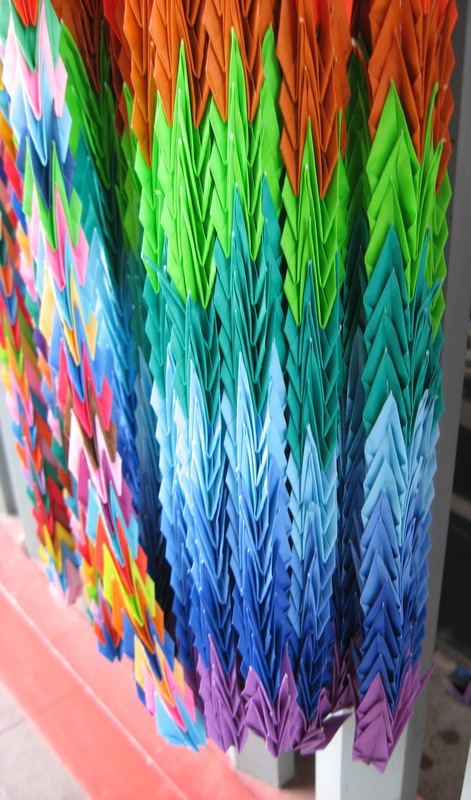 During her illness, she began the task of folding a thousand origami cranes. Sadly, she died before she could finish the task. Her classmates finished the cranes after her death, as a tribute to their classmate. I like both the visual aspect of the cranes and the meaning behind the custom. Maybe I should try folding one thousand paper cranes myself. What do you think?